In many ways I hope this project serves as a sort of bridge between two different chemistry communities, which could be represented by ACS CINF and CHED. Towards this end the OLCC is pioneering a new type of intercollegiate and interdisciplinary course content management system, focused on collaborative teaching and learning, that utilizes social and semantic technologies in both the curriculum development and dissemination phases. 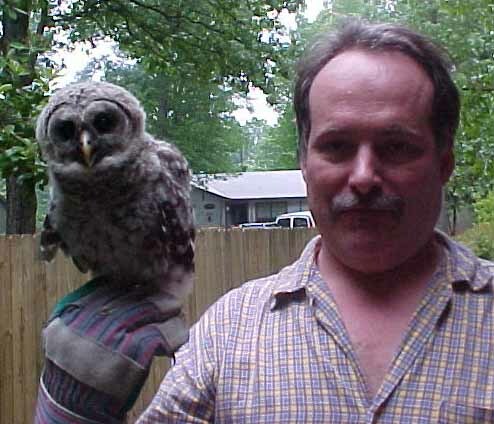 I have often been asked the story behind the bard owl fledgling in the above photo that I have used as my "online photo" over the past 10 years. First, since my youth the Owl represented wisdom, and as a chemical educator OWL represented Online Web Learning. As I became more familiar with informatics I realized OWL represented Ontological Web Language, and thus to me, represents the wisdom of a course like the Cheminformatics OLCC, which bridges these two fields. But for the story, one morning I looked out my window and saw an owl fledgling on the ground, and as our neighborhood had stray cats and dogs I decided to do something about it. I found a lady with an aviarian who was taking care of another Bard Owl (that had broken it's wing) and she took the owl in. Three months later she returned with both owls and we released them into my back yard. 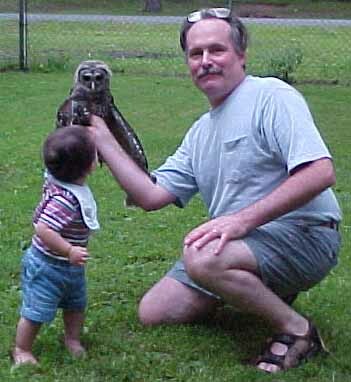 She named our owl "Shannon" (after the town we lived in) and here is a picture of me and my son Vincent releasing Shannon back into the wild, with Shannon flying off to the west. I have often wondered if I did the right thing as it is not good to allow wild animals to feel too comfortable around humans. But 6 years ago I moved to a house about 5 miles west of there and to my surprise and joy have been graced by a beautiful Bard Owl who lives out in the forest in my back yard.